Majority of internet users have Facebook account and use it actively to stay connected with their Facebook buddies. Have you noticed anything strange or mischievous to your Facebook account – like noticing an update, comment, image that you never wrote or added on your Facebook account. 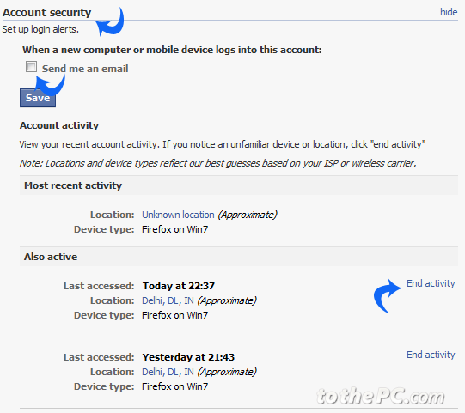 You can easily keep an eye on Facebook login activity and prevent Facebook account from being hacked. 1. 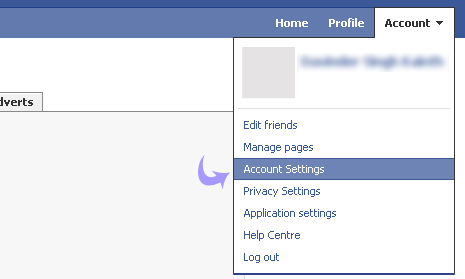 Login to your Facebook account and navigate to Account > Account Settings. 2. Click change button next to the Account Security option on Settings page. 3. It will display Facebook login activity with details like: login time, location and device used for Facebook login. If you notice a mismatch on login information displayed and your actual Facebook login activity, then there is cause of concern. 4. Incase you do notice suspicious login activity on your Facebook account, make sure you change Facebook account password immediately to check on this. 5. For extra security, click to check “Send me email” option. You will receive an email message whenever a new computer or mobile device logs into your Facebook account. I did this and got an IP address that wasn’t mine from a completely different province. I checked out the IP address with GeekTools’ whois, and it confirmed the location. I searched the address on Google, and it listed a few different businesses under the same street address, city, province, and country. One of these business names was the company that provides my satellite internet. At first I thought that their IP address must be used somehow whenever I use the internet, but the timestamp for the activity on Facebook was for a time I wasn’t even on Facebook. What, if anything, does this mean?